Each Pink Ribbon Brooch Pin requires 2.5 hours to make. 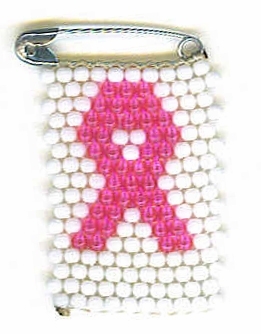 This Breast Cancer awareness color Beaded Brooch Pin is handcrafted by Bridges of Future Orphanage Home in Livingstone, Zambia which was founded in 2004 by Norman Banda due to a high increase in number of orphans in the country. Bridges of Future is a non-profit home that provides care and support for more than 60 orphans, most of whose parents died due to the HIV/AIDS pandemic. These colorful handcrafted bead pins are made by Mr. Banda and his volunteers to help raise funds to provide clothes, food, living facilities, and schooling to the orphans. Some have a double row of pink beads along the bottom, some are white.